Dude this is amazing! Damn, if you are doing absolutely nothing one day, do a Ogre Tank in your style! It's been a while since I worked on these. I really should make more of them. The ogre tank isn't really boxy enough to work well, two specific cars that are on my list right now is a Delorean and an AE86. 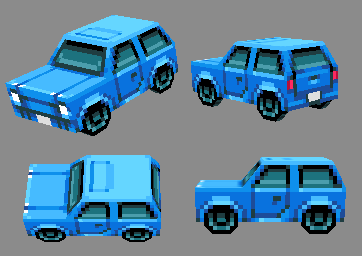 I'm not yet sure what will happen to these vehicles, maybe they'll end up in a game if we come up with a good idea for one. Heavily inspired by Kenneth Fejer, I wanted to do a bunch of low poly vehicles and assets, possibly selling them on the Unity assets store. With that in mind, I'd really appreciate feedback on this first model, a basic car. Edit 3: Added a tank, it's hard to resist the urge of adding more polys. But it's good practice for faking depth and adding detail through textures.